For most of the turf and bog navigations on these pages, we have evidence but little information. 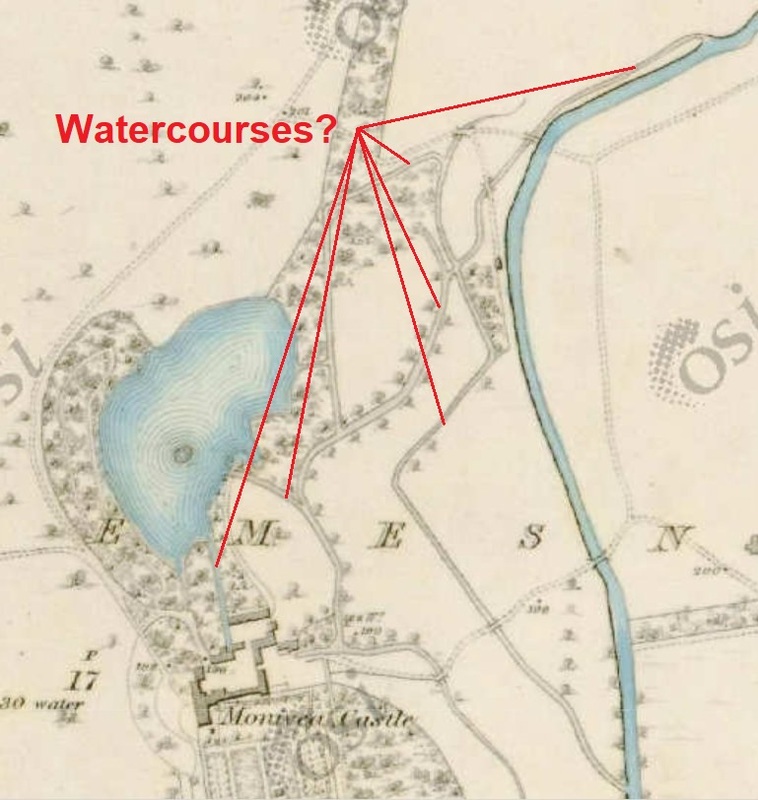 A canal shows up on an Ordnance Survey map, or is known in local legend, or has left visible traces, but there is little information about its construction (by whom, when, why) or its use (carrying what to where in what period). There are some exceptions, and the Monivea navigations can now be added to their number. Monivea is close to Athenry in Co Galway. You can read about its history here. Note the attention paid to the first Robert French, who did much to improve the estate. It seems that relatively little of the estate infrastructure remains, but if you use this link to the Google satellite photos, you should (technology permitting) land on a bridge over a long straight stretch of water. Zooming out and travelling north and south should show the whole thing, with several more bridges. The bridges may not be original (it would be nice of they had lasted from the mid eighteenth century) but the watercourse looks to be either artificial or improved. And so it is — although it may have been further improved by drainage works in and after the nineteenth century. Arthur Young, on his tour in Ireland, visited Robert French [Young used French rather than ffrench] and wrote about him in his A Tour in Ireland: with general observations on the present state of that kingdom. Made in the years 1776, 1777, and 1778, and brought down to the end of 1779 Dublin 1780. In 1769 French had been awarded a gold medal by the Dublin Society [now the RDS] for the improvements he had made over 25 years, continuing work begun by his father. He had written an account for the Society; Young published it in full. French, like W T Mulvany many years later, undertook drainage works that also served for navigation and provided water power (for a mill). Drainage was, however, the primary motivation. His house, which incorporated Monivea Castle, stood on a peninsula with bogs to the north and south, woods to the west and a “deep winding river”, with more bog beyond it, to the east. The raised bogs [here’s one still extant nearby] were so wet as to be impassable, so swollen as to block the view from the lower floors of his house; the river flooded after heavy rain. The river is the Killaclogher, which flows from south (bottom) to north through the estate. It eventually joins [or becomes?] the Abbert, which joins the Clare, which flows into Lough Corrib. 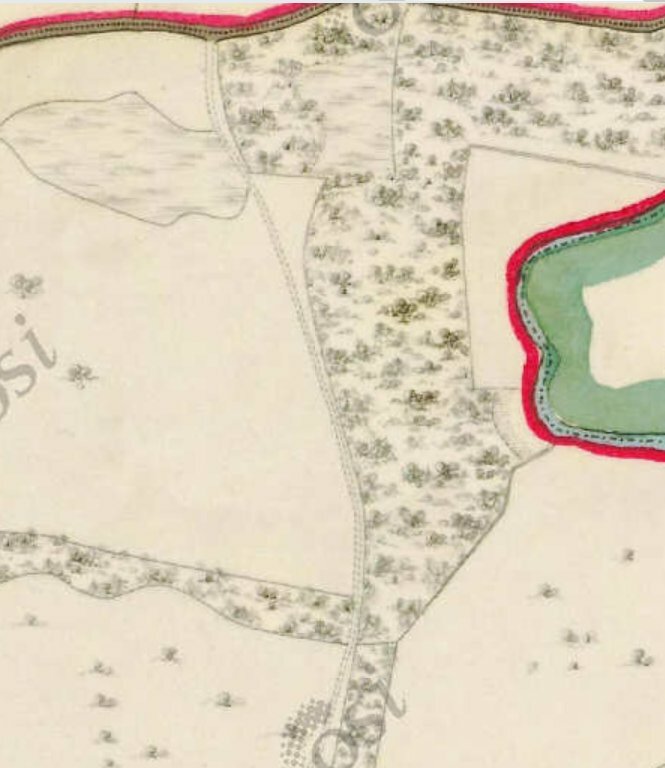 I have not been able to find an eighteenth-century map of the area: if, Gentle Reader, you know of one available on tinterweb, do please leave a link in a Comment below. The problem with the 6″ Ordnance Survey map, in this case, is that it was surveyed about a hundred years after Robert French began his work. He drained the north and east bogs and part of the south, and I know not what other changes were made after his time. His father had made a mile-long drain from the river to the south bog, another drain in the east bog and two in the north, which allowed him to lay out “an approach, 7 perch wide, to his house”. An Irish perch was 7 yards (6.4 m), whereas an English was only 5.5 yards (5.0 m). The approach was, therefore, 49 yards, about 45 m, wide. That may be the track, between two dotted lines, leading south from the road. About half way down on the right is what might be a drain running into the river. 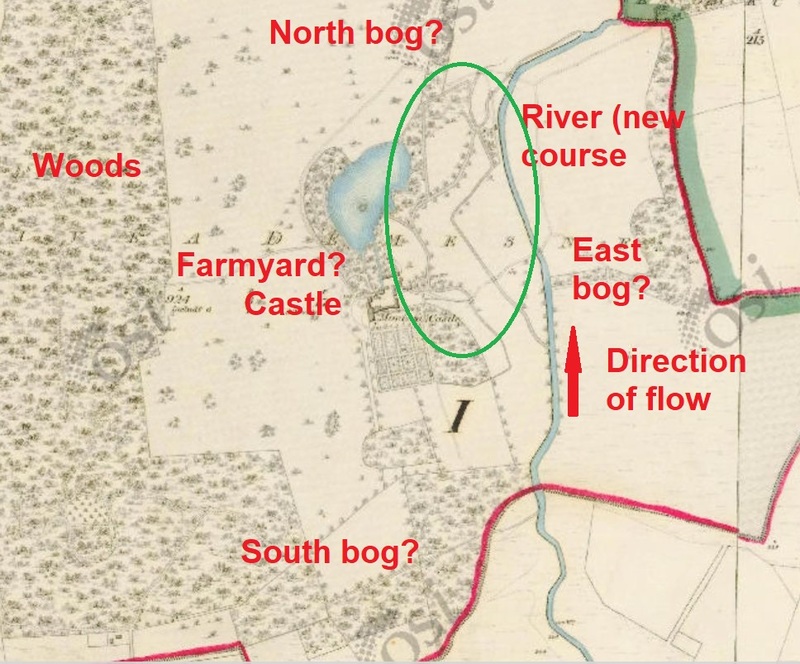 When Robert French succeeded his father, his first act was to “turn the course of the river”, widening and extending the drain in the east bog. He describes the difficulties of digging deep into the bog and of removing old fir trees from the bottom. Some of his works were damaged by floods and had to be redone; his neighbours were not encouraging and even his workers and overseer — at one point he had 30–40 men digging one channel — occasionally despaired, but French persisted. His drain through the east bog, over 90 perches long, became the river’s new course, and I presume that that is what is shown on the OSI map. To the left (west) of the river, circled in green on the first map above, there are several channels, which I guess include the river’s original course. Although some of them are coloured grey, they are clearly watercourses, because they connect with blue channels and because they have bridges over them. French made two banks, one at each end of his new river, to stop the water from going into the old river. The new river was three or four feet higher than the old, and that gave him a source of water power for a bleach mill, while the reclaimed bog around the mill became a bleaching green. He increased the fall by digging a deep channel as a tail race, running into the north bog. 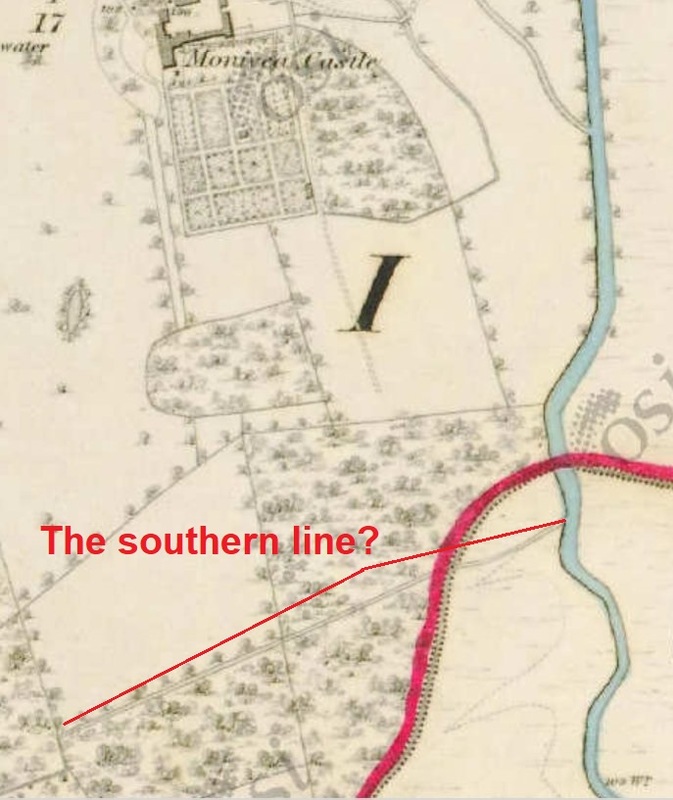 I cannot identify the mill, the green or the tail race on the OSI map; if, Gentle Reader, you can do so, or you know where they were, do please leave a Comment below. French also cut a channel, 230 perches long, from the new river to a lake in the east bog; it was to supply the mill with water in summer when the river’s water level was low. The OSI map shows Lough Kenny about the right distance away, but there’s no sign of a channel. It might have disappeared when the bog dried out. French first used a boat when one of his banks was washed away in a flood. He decided that the replacement should be more strongly built, using stones rather than wooden piles, but access for horses and cars was difficult. The boat carried the stones and then “bog stuff” to add to the bank; he eventually planted trees on top of it. He had installed sluices to enable him to keep up the water level for his new mill and realised that they could make the new river and the old navigable for (presumably fairly small: perhaps 5–10 tons) boats, which could be used to carry manures — which meant materials used in improving the soil: anything from gravel to dung — around the estate. French does refer to “boats”, so he was using at least two of them. It would be even better if boats could move between the old and new rivers; he cut a “navigable line” 16 perches long to join the two. Because the new river was several feet higher than the old, he built a “water lock”, which might have been either a flash lock or a pound lock. Actually his carpenter made it but, as he had never seen a lock, presumably French had to design the lock. The carpenter also made screw pumps, which were used to keep new channels free of water while work was going on. one of 21 perches southward from that western line, enabling boats to reach the farmyard. I’m not clear about the lines to the north bog and the southward arm to the farmyard: the map seems to show two watercourses that might end at the farmyard, but I don’t see them as coming from a western line. Again, of course, matters might have changed between French’s time and that of the OSI survey. about five acres of the south bog. He could not extend his navigable lines into this bog so he had to lay a gravel road. He had gained 32 acres of former bog plus 20 along the river banks and 6 acres reserved for pasture. Many trees had been planted. His navigable lines encompassed 31 acres and he had a mill and a bleaching green. I would be glad to hear from anyone who can provide more information about the Monivea navigations, past or present.